I don't want to become this board's "special preview guy," but EW.com has a look at SPIDER-MAN LEGACY or LEGACY: SPIDER-MAN. And I'm intrigued. Mainly since Dan Slott says Peter Parker isn't going to be a photgrapher again. Alex Ross cover after the cut. Batman hates Green Lantern why? One element of Batman dropped in the nu52 post-FLASHPOINT DCU is that Batman doesn't hate also other superheroes for no good reason. The problem is, I have a hard time coming up with reason why Batman hated all other superheroes that doesn't make Bruce Wayne look incredibly petty. 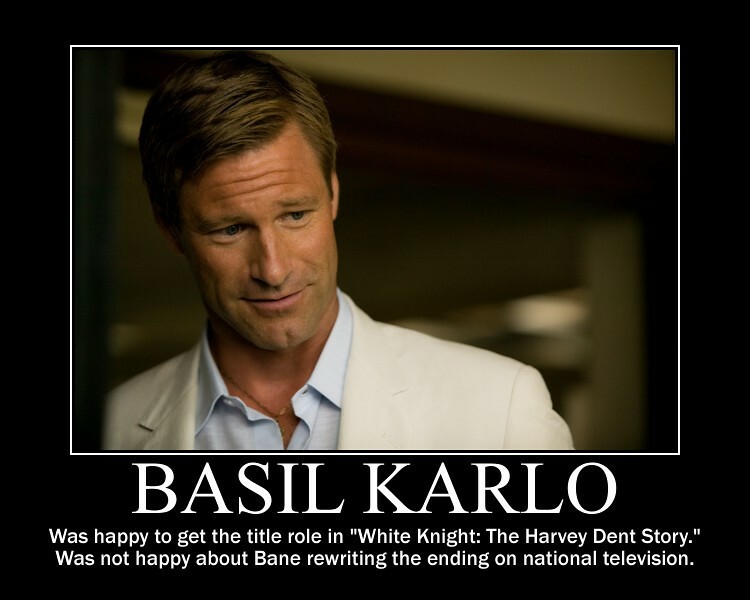 What were other characters from Batman mythos up to during "Dark Knight Rises?" 1. How *did* Bruce get back into Isolated!Gotham? A line about "Bane's men are watching the ice, not the water underneath it" would have helped. 2. With all the movie's talk about legacy and parents and children, with the Liam Neeson and Cillian Murphy cameos, I wouldn't have minded brief appearances from Linus "Thomas Wayne" Roach (not from Batman Begins footage) and Tom "Carmine Falcone" Wilkinson. DreamSequence!Thomas says to Bruce, "I get the mission, I get the costume, I even get the bat. I don't get thinking you don't deserve to be happy." Falcone: You look so much like her, Selina. Like your mother. The Catwoman miniseries "When In Rome" has Selina trying to figure out if Carmine Falcone is her father, so there's history there. It also gives ten times more motive to Selina's wanting the "clean slate." 3. So, everyone thinks Batman killed "those people" before killing Dent. It would be nice to know who "those people" were. "Five people dead, two of them cops" bothers me more than every other plothole in the entire Nolan series. 4. We should really call this version "Talia Ducard," not "Talia Al Ghul." If Christopher Nolan wants to use the French Revolution as a template for Bane's revolution in TDKR, he should remember who took over after the revolution: Napoleon. And what Bat-villian is a lot like Napoleon? Well, a sign that mentions the Iceberg Lounge is being built could have been TDKR's version of the Joker card at the end of Batman Begins. 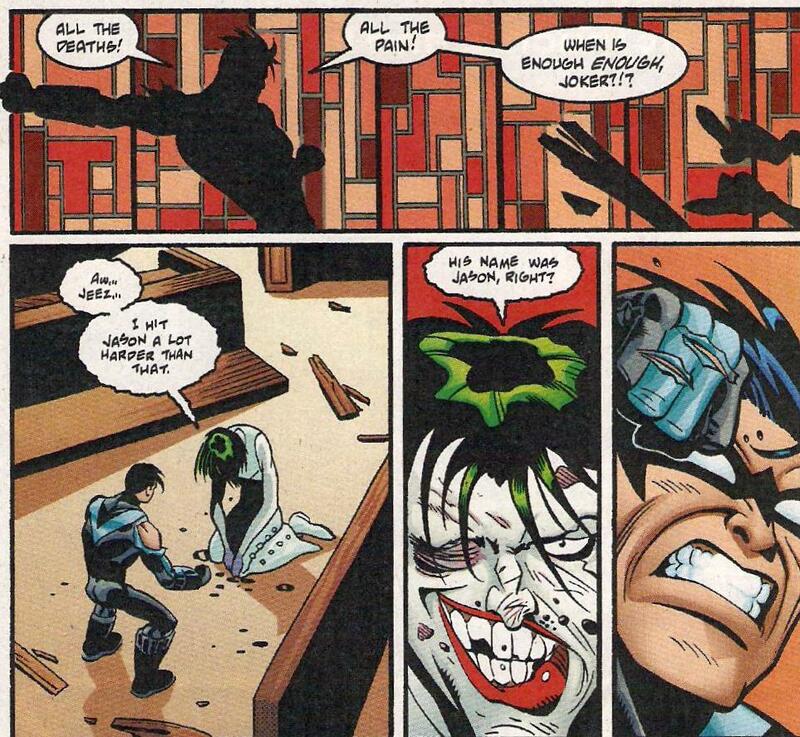 I still consider this the Joker's best line. What do we want in a Black Widow movie? After The Avengers, Thor 2 and Iron Man 3, the question is "What is next?" for the Marvel Cinema Universe. I am hoping for a Black Widow movie starring Scarlett Johansson, but what would we want in such a movie? From X-FORCE (vol 1) #4. Cable vs. Black Tom Cassidy. This story was a crossover with Todd MacFarlane's 1990s SPIDER-MAN series. 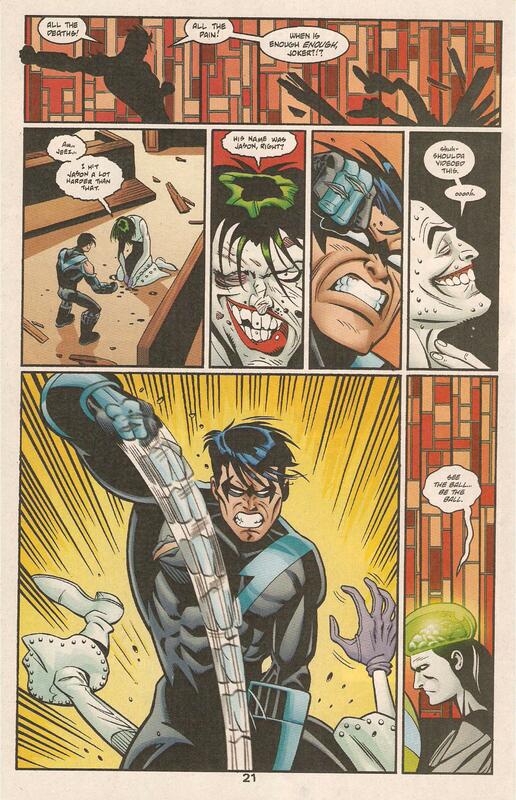 Both issues were drawn sideways. Saturday, the YouTube presentation of Andrew Garfield's appearance at the San Diego Comic Con and some thoughts about lackluster response to the Green Lantern movie gave me a sudden epiphany about Peter Parker, the Amazing Spider-Man. We want Peter Parker to be Barry Allen, not Hal Jordan. It will be a while until IRON MAN 3. At least one AVENGERS movie, maybe even two. But what would we like to see/hear in the third IRON MAN movie? "Sir, at this point I might recommend..."
"Jarvis, I'll pilot the armor by remote control the day I can't get out of bed. Which is different than not *wanting* to get out of bed." "Dr. Johann Faustus. Dr. Amanda Sefton. Dr. Leonard Samson. Jarvis, these are all the names of psychiatrists." "If you wish to contact a psychiatrist, sir, I might suggest building a suit of armor and risking life and limb to pilot it. Mental health professionals will be beating down your door at that point." "So, Agent Barton, how'd you get the nickname 'Hawkeye'?" "I'm a big Alan Alda fan." "You ladies are police officers, right? Because I've been wrong before." "Sgt. Monica Rambeau, Mr. Stark. And it's spelled R-A-M-B-E-A-U, so no comments about wearing a red headband and no shirt." "This is like wearing my own tank. My own tight, humid tank." "I apologize for any fitting problems, Ms. Potts." "It's all right, Jarvis. This suit is chafing me in unmentionable places, but I'm fine." Superman comments on the old days... sort of. Judging by a NYU's professor's regression model on how opening weekend box office numbers predict total movie grosses, and adjusting downward due to expected higher-than-normal opening weekend geek fandom, we'd expect this film to eventually gross about, or just above, $130 million domestically when all is said and done (Paramount holds overseas rights). Funny enough, that happens to be the same figure as the reported budget of the film. I don't think WATCHMEN will "damage" the careers of any of the cast members. All of them have run themselves ragged to promote the movie, and all of them are capable actors. Even Malin Ackerman, the cast member singled out as the "weak link," just as Laurie is often considered the "weak link" of the graphic novel. None of the cast members are straight-up movie stars, but this might give each actor and actress chances at bigger roles. Zach Snyder has been declared a "visionary director," so he's set. Here are a few Lois Lane-themed Motivational (or Demotivational) posters). [Error: unknown template qotd] My first was a picture of Superboy from the DC comics CCG. I am using the current one because I was lucky to find a 'regular' picture of Heath Ledger as the Joker last year. I decided to keep it up as a tribute to the actor. One underrated Oscar moment was the playful nudge James McAvoy gave Saoirse Ronan after the clip where her character sells his character down the river in "Atonement." Actually, given the bright blue eyes both McAvoy and Ronan have, I wouldn't mind seeing a movie where *they* play siblings instead of Ronan and Keira Knightly. Jon Stewart should do a pre-taped routine called "I AM HOST" similar to the bits Billy Crystal usually does. Basically, it's an I AM LEGEND parody with Jon in an abandoned Hollywood. One joke: "I sleep in a bathtub while clutching a high-powered rifle. Actually, I did that before the writers' strike."